Semnox recently extended its presence in the Alabama market with Lumin readers leading the way. Bowling center Bama Lanes, Pratville, AL, operated by Birmingham Vending for over a decade now, is the latest to join the ever expanding network of contented Semnox customers. “We most recently added a Semnox card reader system that has greatly improved the operation. Our technicians love the lack of ticket and coin problems. The guest experience has improved over the use of tokens,” said Steven Toranto of Birmingham Vending. The sleek Lumin readers operate on a wireless network utilizing RFID technology, meaning all the customer needs to do is ‘tap to play’. Birmingham Vending has been a reputed name in the games and amusement equipment industry since 1931. “The value that is already being realized goes to further establish the benefit of implementing a card system. We thank Steven and Jerry for the trust they have in us and we look forward to a mutually successful partnership for years to come,” said Bepin Jose, president, Semnox (Americas). 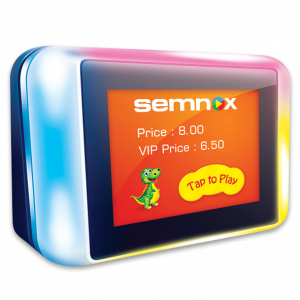 Semnox’s powerful yet simple to use Parafait Point-Of-Sale (POS) software, customizable self-service kiosk, cloud-based inventory management, and eZeeInventory module for redemption purposes are the other services that have been introduced by Birmingham Vending at this family entertainment center. Semnox Solutions Private Limited (https://www.semnox.com/) provides technology and creative solutions for the entertainment and amusement industry. Semnox’s Parafait suites of products are operational at over 1,400 plus sites spread across 50 plus countries.